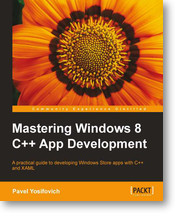 GiveAway – Win A Free Copy of Packt’s Mastering Windows 8 C++ App Development. I am pleased to announce that we have teamed up with Packt Publishing and are organizing a GiveAway especially for you. All you need to do is just comment below the post and win a free copy of Mastering Windows 8 C++ App Development. Three lucky winners stand a chance to win an e-copy of the book. Keep reading to find out how you can be one of the Lucky One. Leverage your existing C++ skills with this new and exciting platform. Discover how to effectively use C++/CX to call Windows Runtime APIs. Integrate XAML for fast and fluid user interfaces. Create custom controls for special UI scenarios. Learn how to integrate your application with Windows 8 by implementing contracts. Build data-driven apps with XAML, data binding, and MVVM. All you need to do is head on over to this page and look through the product description of these books and drop a line via the comments below to let us know what interests you the most about these books. It’s that simple! The contest will close on 25th-July-2013. Winners will be randomly be picked and contacted by email, so be sure to use your real email address when you comment! Update : Thie giveway has ended. The winners will be contacted shortly. Excellent resource for windows 8 dev.